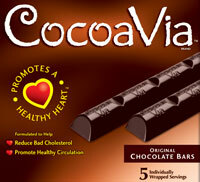 Mars is marketing its new CocoaVia brand of chocolate bars as heart-healthy. And they seem to have science on their side. They're even looking at using their research on the benefits of cocoa to jointly produce with a pharmaceutical company prescription products. The fact that Mars is sponsoring scientific studies in this area isn't new, nor should it necessarily invalidate the results. It's more in the interpretation of the results and the marketing of their products that Mars has to tread carefully. "(The ingredients are) formulated to promote a healthy heart. … CocoaVia is the only product that contains a patented blend of heart-healthy cocoa flavanols and cholesterol-lowering plant sterols from soy. The new line of snacks also is fortified with calcium and a mix of heart-healthy nutrients including folic acid, vitamins B-6, B-12, C and E."
Balance that against warnings from dietitians not to take this as carte blanche to eat as much chocolate as you want. Still think this is just a granola marketing gimmick? Research suggests that cocoa could be the base for a cheap, effective treatment for diarrhea, one of the leading causes of child deaths in developing countries. Wow! That's pretty interesting. I can't believe that there's a chocolate bar out there that is supposed to be healthy. This goes against everything my mother told me growing up..."Don't eat chocolate, its bad for you," "Chocolate will rot your teeth," etc. Mars is definitly going to have to be very careful when they market this product. There are some people in the world who are just looking for a cure to whatever is ailing them and they'll try anything. I would hate to see people eating chocolate bars to try to feel better. It seems like its sort of like a glass of red wine. A little is good for you, but too much of a good thing can still be bad. Hopefully, Mars will market it the right way and people will understand what it really can do and what it can't. The new line of snacks also is fortified with calcium and a mix of heart-healthy nutrients including folic acid, vitamins B-6, B-12, C and E."this is useful research for humans.